Introducing Hot Earth Solutions and Technologies. Air Burners Inc’s PG Firebox website. 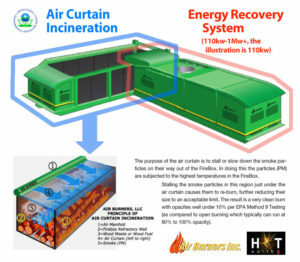 Air Burners uses the heat capturing system and the electrically driven FireBox from our 100kW PGFireBox design for the “PG FireBox Thermal Energy Recovery System”. In the Air Burners/Aqylon system the TERS system powers the Aqylon ORC. The TERS is designed to capture the exhaust heat from the FireBox using a patented system that includes a retractable heat collection hood. The clean, hot gas leaving the FireBox is directed through a heat exchanger before being exhausted to the atmosphere. The Heat Capture Module provides connections for the thermal media to be circulated through the heat exchanger. This heated thermal media is then sent to the Aqylon ORC where it is used to power the generator. The system depicted in this illustration is the 5MWth (five megawatts thermal energy) which is the heat energy required to power a one megawatt electrical generator.